Well if you are superstitious, this week probably strengthened your beliefs. Week 13 was a strange one. AJ Green and Greg Olsen had their seasons ended by foot injuries. Tyler Boyd, Julio Jones, Lamar Jackson, Matt Breida, James Conner and many others all had injury scares and left the game at some point. Two players broke their legs. Even the games themselves were weird. Luck and the Colts were held scoreless by a Jacksonville defense that has been bad this year. The Falcons had 131 yards of offense. Let's hope we don't see a repeat going into (for most of us) the first week of the playoffs. 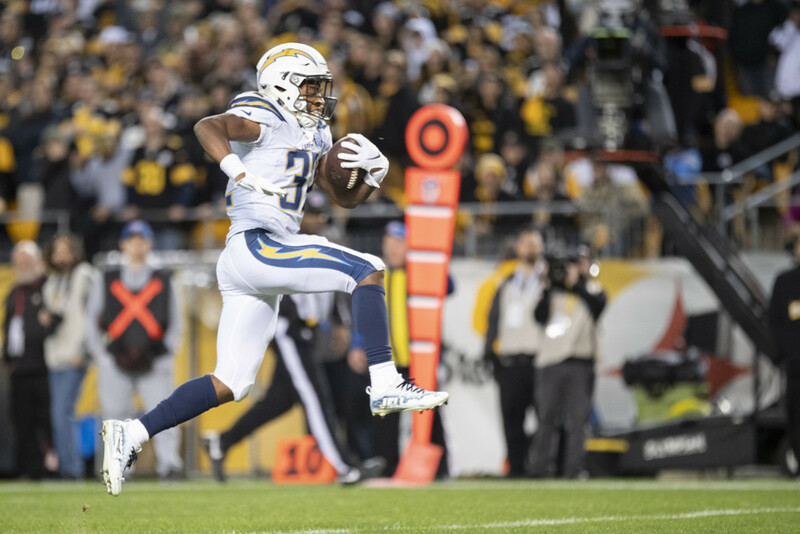 It was Justin Jackson, not Austin Ekeler that played extremely well in Week 13's matchup with the Steelers. Jackson rushed 8 times for 63 yards and 1 touchdown, leading the Chargers to a surprising upset/comeback. Ekeler was continuously stuffed at the line, which is now the second time that Ekeler has failed to produce with Melvin Gordon out. The Chargers face the league worse Cincinnati Bengals' run defense in Week 14, and if Gordon sits again, Jackson is a must start. Pay attention this week to see what the coaches will do, but it seems like a no brainer to start Jackson in the Gordon role and let Ekeler stick with his pass catching duties. With Alfred Morris inactive and Matt Breida reinjuring his ankle in warmups, undrafted running back Jeff Wilson Jr. got the start in Week 13 against the Seahawks. Wilson looked good this past week, rushing 15 times for 61 yards and catching 8 passes for 73 yards in a Seahawk blowout of the 49ers. Wilson was targeted 9 times this past week, meaning he can both run and catch. Wilson gets a tougher test next week against the Broncos, although they did just lose CB Chris Harris for the season and DE Derek Wolfe is banged up. If Breida can't go, Wilson is a must add due to volume alone. Sticking with the 49ers, WR Dante Pettis had his second good game in a row, catching 5 of 7 targets for 129 yards and 2 touchdowns. With the only other reliable target being TE George Kittle, Pettis has been a solid fantasy start the last two weeks. Both WR Pierre Garcon and Marquise Goodwin have missed the past few weeks, so it all depends if either of them come back next week against the Broncos. If not, Pettis is a solid fantasy option, especially since star CB Chris Harris is done for the season with a broken leg. He should be picked up in 12-14 team leagues. Adam Humphries is half owned, but he has to be brought up still because he has such an amazing matchup next week against the Saints. In Week 13, Humphries was targeted 9 times, catching 7 of them for 61 yards and 1 touchdown. The Saints are allowing a ton of yards to opposing teams, and Humphries has been a favorite target for QB Jameis Winston. With WR Mike Evans probably facing the best CB Marshon Lattimore, Winston will probably look to Humphries and WR Chris Godwin to get the win. Humphries may struggle after this week, but he needs to be started in this likely shootout. Jaylen Samuels hasn't been used a ton this year, but it seems like he does get used when/if RB James Conner leaves the game. And that's exactly what happened this past week. Samuels rushed 2 times for 5 yards and caught 3 passes for 20 yards and 1 touchdown. That might not sound that exciting, but Conner did leave late in that game. If Conner misses time, Samuels has a decent chance at getting a good amount of work in the passing game. Steven Ridley will probably carry the ball more, but Samuels will still be more of a pass catching option. Samuels also has a TE designation in Yahoo for now, so if Conner sits, Samuels is a high risk, high reward TE start that could give you some rushing yards (and maybe a TD). This week we are going to look at the Bills' defense, who blew out the New York Jets 41-10 in Week 10 in New York. Now they get to face the Jets at home, and have played solid defense the last two weeks (although it was against easier teams). The Jets have lost 6 in a row, and the highest amount of points they put up was 22 last week (5 FGs). The Bills are a sneaky start this week, but it might be hard to trust them with your first week of playoffs, so I understand if you pass on this one.